Take one glance at Lan House's menu and it's immediate the restaurant serves more than the typical American Chinese's sweet and sour chicken variety. Spicy squid and shrimp, jelly noodles, spicy rabbit. It's all there on Lan House's sprawling menu. "When I was growing up, I was exposed to food culture and the family business a lot," owner Max Z said. "I want to make people happy. There's a million ways to try and make people happy but there's one simple way to make someone happy: give them good food." Z, who is from Lanzou, China is bringing recipes and cuisine from his native region to downtown. Since opening in the spring, Lan House has garnered praise from both customers and reviewers. 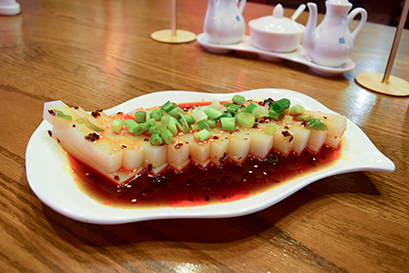 Z said Lan House is the real deal, in terms of serving up genuine Chinese food. All the cooks at the restaurant have been trained in Chinese cuisine and have worked as experienced cooks for many years. "We can back up our words," Z said. "This is the food Chinese people eat every day in China." 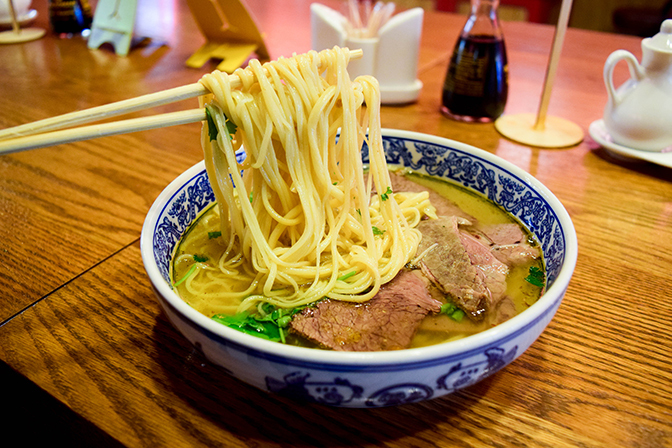 Unlike many Chinese restaurants, noodles at Lan House are homemade and hand pulled. Z said homemade noodles makes all the difference in a Chinese dish, especially to those who grew up eating them. "I know the Chinese and Asians in this country," Z said. "They have trouble finding the good food and some people have homesickness. And myself too. I really miss my hometown noodles and I [couldn't] find it in all of Nebraska. There are a lot of kids from my hometown area and we Chinese people live on noodles and we want our fresh, homemade noodles. This is a beautiful city, there's a college with talented young people so why not give them some food they want. I want to give them that." Since opening, Lan House has seen a large amount of international students, especially from China and other Asian countries. Z said this is a testament to the quality of food at his restaurant. The goal of Lan House extends beyond providing authentic Chinese cuisine, however. Business partners Pascale Muellner and Z both expressed a desire to have their customers engage in conversations about their culture. Though there is a more private space in the restaurant's basement, the upper level of Lan House offers multiple communal high tables for various parties to sit together and talk. "Obviously not everyone has to do that but if they want to engage, they can," Muellner said. "We totally believe in diversity, we totally believe in a world where everyone can get together and get along. By sharing this authentic food from China, people will get a different idea about China and their food." Z offered the same sentiment, saying a cultural exchange is one of the main purposes for opening the restaurant. "Food is a big part of culture," Z said. "Can you grab culture? Can you touch culture? You can't. But there's some substantive stuff that is culture. For example, food is a really big representation of American culture. You eat the food and you can easily get into a topic through it." Muellner said some customers come to Lan House expecting American Chinese food and are surprised at their authentic menu. He said he hopes to make it easier to educate customers on what and how to order at the restaurant. "I think some people get confused because they come here and don't see dipping sauce or stuff like that," Muellner said. "But there shouldn't be. Sometimes there's misinformation and we definitely want to clear that up so people know we're not just your next Panda Express or we're not the next door American Chinese place. It's a different experience when you come to this place." Lan House also offers family-style portions of food, usually enough for a minimum of two people. These larger portions also come with a prices double that of a single portion meal, something Z said can be confusing for some customers. He said he hopes to make the menu more understandable in the future for those unfamiliar with authentic Chinese menus and offerings. In appealing to a broader audience, Z and Muellner hope to aid in the 'lunch madness' of downtown and offer filling, quick meals for those on the go. "We really want to contribute to the [downtown community], the people have lunch madness in this area," Z said. "They only have a certain amount of time to eat, but 'we don't have time' doesn't mean 'we have to sacrifice our taste.' We need to provide quality food in a short amount of time. That's another thing, we want to reach. Eat healthy, eat fast. So that's something we aim for as well. Lunch is probably the most important food of the day. You're rushing to work already, you grab a coffee, swallow a piece of a bagel so you have to treat yourself with a good lunch. You can have a really good tasting lunch in a short amount of time." Whether over a quick lunch or a lengthy dinner, Lan House aims to unite customers and cultures alike through their food. "That's basically our vision, to join people together with traditional food," Muellner said. "There's an emphasis on traditional and authentic because, obviously, you can open a place and say it's authentic and from the origin, but it's really hard to provide that same quality. Obviously it's never going to be 100 percent perfect, but as much as you try, you can get up there [in terms of authenticity], and then people don't have to travel far to get that experience and that culture. Not everyone has that possibility or chance."